The Chief Of Seattle are an unsigned Manchester five-piece who are taking the unusual step of releasing not one but two singles. Faced with a difficulty akin to trying to pick a favourite identical twin, we've gone for Heart Of A Stag as our Track Of The Day. The band only formed less than a year ago and self-released a five-track CD last year. Heart Of A Stag is the follow-up to that EP and is ushered in by beautiful hazy guitar and vocal harmonies before Anne-Marie Gibbins' welcoming vocals that deliver so much more than the rather modest indie folk description that they bestow upon themselves. 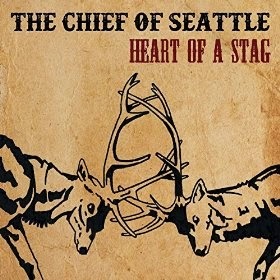 Heart Of A Stag is available digitally via iTunes as is its sister track Remain. The Chief Of Seattle's official website can be found here. They are also on Facebook, Twitter and Soundcloud.